Given a word association test, an overwhelming number of laser users would answer “laser eyewear” when provided the phrase “laser safety.” Of course, laser eyewear should not be one’s default answer ― rather, “beam control” or “remote viewing” is a much better approach. Nonetheless, when it comes to laser protective eyewear, a number of factors go into selecting the best option, and some are more important than others. First, one must determine the correct optical density (OD), defined as the log ratio of the incident beam over the transmitted beam. Factors that go into the calculation will vary, depending on whether the beam is continuous wave or pulsed, and OD is calculated for each wavelength one determines they need protection from. If one selects a protective filter based solely upon wavelength and optical density, the selection will be satisfactory. Unfortunately, satisfactory is not always good enough to provide safety. The majority of laser accidents in academic, research, or fabrication settings occur when eyewear is available but is not worn. The most common contributing factors to eyewear not being worn include the user being unable to see the beam, or even see it well with the eyewear on; the eyewear frame does not fit well; or the eyewear is too heavy. Next, visible light transmission (VLT) refers to how much visible light penetrates the eyewear filter. Depending on the dye or filter coating and the eyewear material, as well as how many wavelengths the filter is designed to block, VLT can be as little as 1 percent or as high as 96 percent. The European Normal 207 (EN207), on eyewear, indicates a VLT of about 20 percent is the minimum for a well-lit room. Thus, in filter selection, the user or Laser Safety Officer needs to consider the lighting conditions in which the eyewear will be used: bright room light, or low-light to no-light conditions, for photon sensitive work. As an example, the traditional plastic filter for a 1064 nm (near infrared wavelength) is a green tint. If a glass filter is selected, the filter is almost clear. So, if visibility is critical, the heavier glass filter would be the best choice. But, as described, the filter and frame are considerably heavier, requiring straps to keep on and leading potentially to user fatigue. Happily, in the last three years, a gray plastic filter has entered the market covering 1064 nm, and I expect it will become the standard filter for 1064 nm users. Overall, glass filters will always offer greater VLT, but will be heavier on the face. Reflective filters, as a rule, provide a higher VLT than dye-based filters. But, just like their name hazards, reflective filters can reflect beams onto others. A new consideration, related to VLT, is visuality acuity, which gauges exactly how well one can see through the filter. For example, think of the yellow, night-time glasses that cut headlight glare. Their actual visible light transmission is low, because they cut much of the blue visible spectrum, but they still offer enhanced vision and greater acuity. When is too much of a good thing too much? When OD is provided by a tinted dye, using eyewear with an OD in excess of what is needed will just darken the filter, reducing VLT. Frame fit is another oft-overlooked factor in eyewear selection. Not every filter comes in every frame style. This is due to the limitation of obtaining an even coating if the frame style has too severe a curvature, as is the case with some wrap-around frames. This is why some filters only come with a limited number of frame styles. Another important aspect of frame fit is how well it fits the bridge of one’s nose. Eyewear that slips down one’s nose does not provide eye protection. The easiest solution is to get straps to hold the eyewear in place. In recognition of this problem, several frame styles and frames adjustable at the temples have been developed. Another aspect of fit eliminating gaps in the eyewear frame, along the temple sides or below the lens. For me, this is more psychological than anything else. In 30 years, I am only aware of 2 incidents where someone was injured by a beam coming from behind them, hitting the inside lens and reflecting back to the eye. So, for some, if any gaps are present, they will not wear the eyewear; for others, if the frame fits well, they will tolerate some peripheral gaps. On the surface, many lasers produce too many wavelengths to find protection for. The solution is not to give up on eyewear, but to determine which wavelengths actually are being used, when they are being used, and which wavelengths can be enclosed ― and then deciding if more than one pair of eyewear is required. Beware 800 nm Trap! I like to use this term for wavelengths in the 750-850 nm range. Visual perception of these wavelengths by the human eye is less than 1 percent. Think of an iceberg: only 15-20 percent floats above the waterline. A large number of laser accidents have occurred when users saw a faint 800 nm beam spot and thought it was a weak reflection. Remember, if I am capable of perceiving less than 1 percent, and I can see the beam, there has to be a lot of energy there. The National Institute of Standards and Technology (NIST) has reaffirmed that ultrafast pulses are faster than the relaxation time of the majority of absorptive dyes used in eyewear. Hence, listed ODs may not hold up. The solution is beam containment and awareness. Finally, know that laser eyewear will fail! No pair of laser protective eyewear is made for one to stare down a rogue band of photons. Plastic eyewear has had holes burn through it, melted, and burst into flames. Glass eyewear has shattered. By the way, laser eyewear is not required to be shatterproof. If this is a critical factor for your application, check with manufacturer ― do not assume it is shatterproof. As it is in fashion, so it holds true for laser eyewear: It is better to buy a pair of comfortable boots than ones that look fashionable but do not fit. 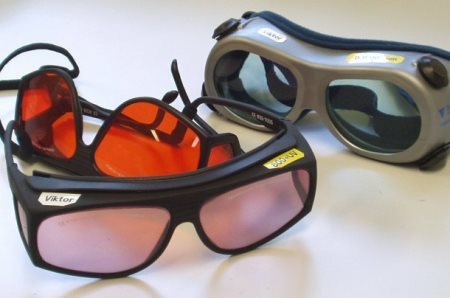 Laser protective eyewear can only do its job if worn and the proper selection is made. The more one pays attention to the selection process, the better one’s choice, and the safer one will be. Ken Barat, CLSO, is the principal consultant at Laser Safety Solutions. He is the former Laser Safety Officer for Lawrence Berkeley National Laboratory and the National Ignition Facility. He is the author of several text books on laser safety. He has served as the laser safety adviser for Laser Interferometer Gravity Wave Observatory, ELI, and Allen Institute, among others. Laser Institute of America Fellow, Rockwell award winner and senior member IEEE & SPIE. Part of “Ask the expert” team for the Health Physics Society. The organizer and executive director of the first seven LSO Workshops.